To apply to Saint Louis University, prospective students must submit official academic transcripts from undergraduate coursework, a current resume, GMAT scores, two letters of recommendation, a personal statement, and a completed application form and related fee. The full-time program enrolls students once a year, in May. Part-time students are rev...To apply to Saint Louis University, prospective students must submit official academic transcripts from undergraduate coursework, a current resume, GMAT scores, two letters of recommendation, a personal statement, and a completed application form and related fee. The full-time program enrolls students once a year, in May. Part-time students are reviewed and accepted on a rolling basis, all year long. In recent years, the average GMAT score for entering students was 570. The John Cook School of Business has its own dedicated Career Resource Center, which serves both undergraduate and graduate business students through one-on-one career counseling, job search strategies, and resume revisions. “The Career Resources Center is top-notch,” and it “frequently holds seminars and networking sessions” for MBA candi­dates. Among other programs, the School hosts company information sessions and casu­al meet-and-greet events with local businesses. 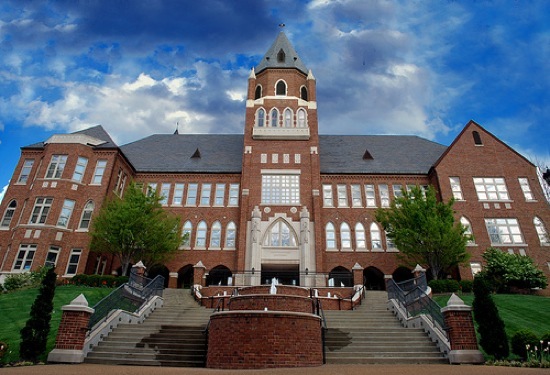 In addition, SLU has done “a great job integrating with the local business community and in connecting with alumni.” However, students in the part-time program mention that the school might improve the process of “mentoring and advising those of us looking to change careers,” though those who want individual attention can seek out the dedicated graduate career advisers.Saint Louis University graduates work at companies that include Anheuser-Busch/InBev, The Boeing Company, Express Scripts, Wells Fargo, Cintas Corp, Monsanto, and Emerson. Graduates have a mean base salary of $57,450, with a range from $40,000 to $82,000. Marketing and sales are the two most popular career fields for SLU graduates. Boeing Institute of International Business, U.S. Bank Advancing Women in Leadership Program, Emerson Ethics Center, Smurfit-Stone Center for Entrepreneurship, Center for Supply Chain Management, Simon Center for Regional Economic Forecasting. Hong Kong for full-time MBA; Hong Kong + Madrid, Spain for part-time MBA. Patrick J. Sly - Executive Vice President, Emerson Electric Co.
Want more info about Saint Louis University John Cook School of Business Part Time MBA? Get free advice from education experts and Noodle community members.